The Reverie Rally 330 lightweight Carbon Fibre steering wheel is designed for race and motorsport applications, but can be used in road cars too. Available also in flat-bottomed style, the Rally 330 steering wheel was used by the Citroen World Rally Team in their WRC rally cars, driven by Sebastien Lobe, winning every World Rally Championship between 2003 and 2010. The Rally 330s features a 330mm outer diameter with an inner diameter of 285mm and weighs just 320g (approx.) It is available with various different drilling patterns including MOMO/Sparco/OMP, 3-stud, Raid, Nardi or undrilled. We are able to provide custom drilling patterns upon request. For extra comfort and grip, the Rally 330 can be specified with luxurious Alcantara trim. The Rally 330 can also accept the Farringdon ST8600 Steering Wheel Display (not supplied). 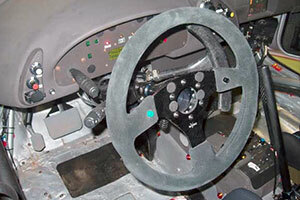 View our full range of our Rally 330 steering wheels. Below, first select between flat-bottomed or standard round, then which drilling pattern you require (if you require a special drilling pattern, please contact us first), then select untrimmed or Alcantara trimmed (note: the flat-bottomed 330 is only available trimmed), then select whether you require 2, 3 or no button holes and finally select whether you require the steering wheel to be able to accept a Farringdon ST8600 display (not included).